Joe Newell in action for Posh. 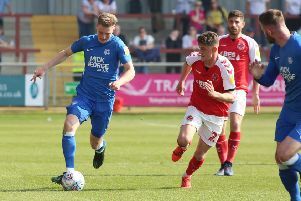 Peterborough boss Grant McCann insists he is not bothered about facing former players with points to prove at the ABAX Stadium tomorrow (August 19). There are six old Posh boys in the Rotherham squad heading to the city for a match between two sides in free-scoring form and a couple might be keen to see their old manager defeated. Jon Taylor playing for Posh. McCann despatched Jon Taylor from his squad last summer - although the winger landed on his feet by joining a Championship club - and defender Dominic Ball was sent packing by the Posh boss, after a brief loan spell, following a pre-game bust-up. Joe Newell, Jonson Clarke-Harris, Lee Frecklington and David Ball are the other former Posh men in the Millers’ squad. McCann played with Frecklington and Newell. “Playing against former players doesn’t bother me,” McCann stated. “It happens all the time these days. In fact it’s happened in our last two matches. “It adds interest to a game, but it’s not something I dwell on while preparing for a game. Dominic Ball during his loan spell at Posh. “I let Jon Taylor go because I couldn’t see him suiting the formation I wanted to play last season. “But he is a very good player and a great lad, although he’s not been a first choice for Rotherham this season. “Joe Newell might think he has a point to prove. He had a tough time with our fans when he first broke into the Posh team which was a shame. “I rate him. He will probably play on the left side of their midfield and he will be a threat. McCann watched Rotherham lose their opening Checkatrade Trophy game on penalties to Manchester City Under 23s on Tuesday (August 15), but what he learnt is debatable as Millers’ boss Paul Warne made 10 changes to his starting line-up. McCann believes attacking midfielder Marcus Maddison could be the difference between the sides. “I’ve been impressed with how Marcus has started the season,” McCann added. “There has been a lot of speculation about his future, but he knows all he can do is knuckle down for us and play well.